1. Heat 1 tbsp of the rapeseed oil in a large saucepan, add the chopped vegetables and sage stalks and cook for 4-5 minutes until golden. Pour in the chicken stock, bring to the boil and simmer gently for 30 minutes until reduced. 2. Preheat the oven to 200°C, gas mark 6. Meanwhile, heat the remaining 1 tbsp oil in a roasting tray on the hob, add the venison racks and seal on all sides, then season. 3. Roast for 5 minutes then turn down the oven to 180°C, gas mark 4. Add the butter and sage leaves and roast for a further 20-25 minutes (for rare), basting the meat regularly. 4. Remove from the oven, transfer onto a warm plate and allow to rest in a warm place. 5. To make the red wine sauce, gently pour away the excess oil from the roasting tray. Return the roasting tray to the hob, pour in the red wine and reduce by half. Pour in the reduced chicken stock and bring to the boil. Continue to simmer until it has reduced by two thirds then strain into a clean pan. 6. Meanwhile, for the chicory, cook the bulbs in boiling water for 2-3 minutes until just tender, drain thoroughly and cut each bulb in half lengthways. In a frying pan melt the butter, then place the chicory cut side down in batches in the hot butter, turn, and when well coloured, season and remove from pan. 7. Beat the cold diced butter a couple of cubes at a time into the red wine stock until smooth and thickened, then season to taste. 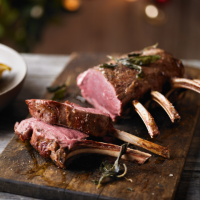 Carve the venison and arrange 1-2 cutlets on each plate, place alongside the caramelised chicory and scatter them with chives. Spoon round the sauce and serve.